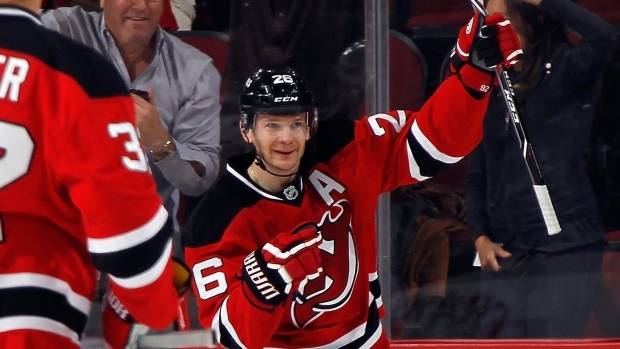 NEWARK, N.J. - Patrik Elias was in a reflective mood after notching his 1,000th NHL point. Elias had a goal and two assists, and the New Jersey Devils beat the struggling Buffalo Sabres 4-1 on Tuesday night. "I don't think I ever considered myself a goal scorer, coming here when I was 19 years old," said Elias, who notched No. 399 on Tuesday. "I love playing hockey, being a playmaker. I never imagined I'd be in this position." Now in his 17th season — all with the Devils — Elias reached the milestone in his 1,187th game. "It's special to do it for one team," the 38-year-old Elias said. "Sometimes it's hard to score, the way we've played our systems. You have great years, you have injuries. You have to battle through it. It's not easy to get to 1,000 points." Travis Zajac and Michael Cammalleri each had a goal and an assist. "When a guy's played 1,000 games, that's a really great career," Cammalleri said. "Now 1,000 points, that's a whole other level. There's a lot that goes into that. It's quite an accomplishment for him." Jordin Tootoo also scored as the Devils won consecutive games for the first time since Nov. 14. Cory Schneider made 20 saves. It seems as though the Devils need a milestone from a veteran to get a victory these days. The modest two-game streak began Saturday night against Philadelphia when 42-year-old Jaromir Jagr scored three times and became the oldest NHL player to have a hat trick. On Tuesday, Mikhail Grigorenko netted his first goal of the season for the Sabres, who have lost five straight and are 1-8-1 in their last 10 games. "We're not playing within our system," defenceman Tyler Myers said. "We're not doing things we normally do. I think it all comes down to preparation." Myers returned to the Buffalo lineup after missing seven games with a lower-body injury. The Devils dominated the first period, jumping out to a 3-0 lead and outshooting the Sabres 13-4. Elias had a goal and an assist in the frame. He opening the scoring at 3:44, redirecting Cammalleri's pass between Jhonas Enroth's pads. Tootoo made it 2-0 at 9:49 with a wrist shot from above the left circle that sailed over Enroth's glove. Schneider earned the second assist, giving him his first point with the Devils. With New Jersey short-handed, Elias chipped the puck out the Devils end and sent Zajac on his way to a breakaway goal at 14:39. "The reason we got the results early is that we played the way we like to play," Cammalleri said. "We made strong decisions with the puck, and we wound up on the positive end of things." Buffalo regrouped to start the second period, and Philip Varone and Chris Stewart tested Schneider in the opening minutes. The Sabres' persistence paid off when Grigorenko ripped a power-play shot from the high slot past Schneider at 6:40 to trim the Devils' lead to 3-1. Buffalo again pressed the attack midway through the third period, and came close to scoring when Varone hit the post. "We only played 40 minutes tonight and you need to play 60," Sabres forward Nicolas Deslauriers said. "We had some opportunities, some good chances. We just came out too soft, and they took it to us." The Sabres couldn't break through again, and Cammalleri iced the game for New Jersey with an empty-net goal. That gave Elias the milestone assist as he became the 82nd player to reach 1,000 points. NOTES: The Sabres recalled Varone and C Brian Flynn from Rochester (AHL) on Monday. ... Buffalo scratched RW Brian Gionta (upper body), RW Drew Stafford, D Andrej Meszaros and D Andre Benoit. ... New Jersey scratched LW Martin Havlat (illness), D Peter Harrold (facial injury), and D Eric Gelinas (illness). ... Devils D Mark Fraser and Stewart fought right after the faceoff following Elias' goal. ... Schneider has seven career assists. Martin Brodeur, the longtime goalie he replaced, had 45 assists and two goals with the Devils.